Look up “audit” in any dictionary. The first definition should be: “Ugh.” Who on earth would choose to spend time auditing content, let alone teaching others how to do it? A content strategist like Laura Creekmore, that’s who. Someone who knows that without a deep understanding of your existing content, you’re working in the dark. 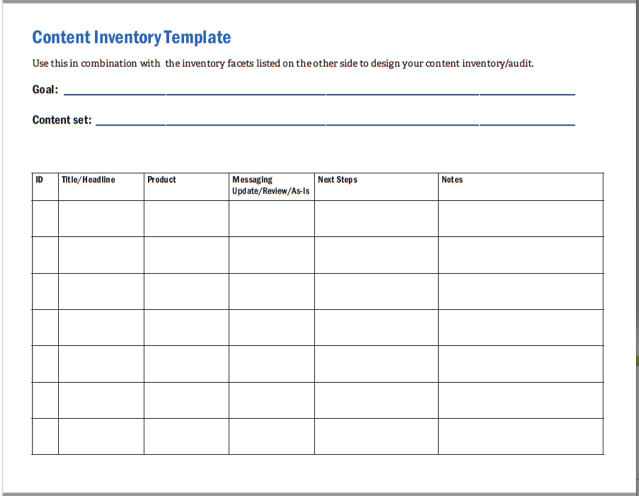 A content inventory is a list of content items, just like the kind of list you’d make if you managed The Gap and took inventory of all the clothing in your store. A content audit is an analysis of the inventory. It’s a foundational part of a content strategy. Identify the content to include. Inventory the content to be audited. Audit the content in your inventory. What content problems do you most want to address? Choose your audit’s main goal accordingly; your goal determines everything you do in your inventory and audit. For example, if your goal is to figure out how to organize the content you’ll bring into a new CMS, you may want to spend zero time evaluating messages for consistency. Get rid of ROT (redundant, outdated, or trivial content). Understand the scope of your content of all types. Compare content quality to a standard (such as accessibility or reading levels). Evaluate content for consistent messaging. Assess which content you need to migrate to a new platform. Figure out how to better organize content for findability. Discover whether metadata, such as tags and categories, has been used as intended. Support more balanced editorial planning. Ask yourself: If I were auditing my organization’s content, what goal would I focus on? For example, the first web inventory Laura did was for a website with tens of thousands of pages. At first, she didn’t want to do it; her team had put all that content there and knew what it was. She did the inventory anyway and, after delivering it, discovered that the client had not, in fact, known all of what the website included. In retrospect, Laura was glad that the client had asked for a thorough inventory of the website. You must also know what content exists in company channels other than the website — in training materials, call-center scripts, social media posts, and point-of-sale materials. A single customer may take a webinar, follow the company on social media, call the 800 number, and show up in a store. Does that customer get the same information and the same messaging everywhere? You can’t answer that question without a comprehensive inventory and audit. You must have an omnichannel perspective; your messages must come through, in every channel, clearly, and accurately. If you’re tempted to inventory less than everything, evaluate a representative sample. “Do more than you think is enough,” Laura says. 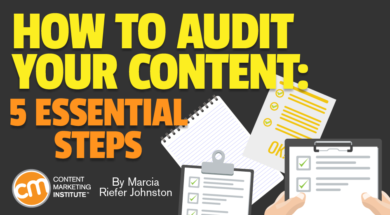 Ask yourself: If I were auditing my organization’s content, what content would I include? If a subset, then what channels, content types, etc., would we exclude? How would we determine that our subset was sufficient to meet our goal? Content summary. Since the headline or title doesn’t always adequately convey the topic covered, summarize the content. If the content is short, consider copying it. Navigation information (in page-based audit). Document how people find their way to the content. List the template this content is based on. Confirm whether the content follows a standard look and feel. Supplements (image, audio, video, PDF, etc.) Detail the media files people can download or otherwise experience. You may want to note these as facets or capture this information elsewhere. Sharing/other tools available. List the available tools for sharing digital content. Are you enabling people to share? Do you want them to? Could you make sharing easier? What other tools do you give people access to? Audio or video file (type, length, size, format). Document the characteristics of audio or video files you want to capture. Image file (type, dimensions, size). List characteristics of image files you want to capture. Identify whether you want to know file size for PDFs. Also question whether PDF is the best format for that content and if people will find that content valuable. “Too many marketers are giving people trash content for email addresses, giving everyone else a bad name,” Laura says. List whether access to this content requires login, registration, multiple permission levels. You may want to capture information like browser title, keywords that you want to rank for in searches, description text, H1 text. You might also want to note whether an SEO description exists or is coded correctly to show up as a snippet in the search results. And more facets. Examples: asset type, content quality. Whatever else you want to know depending on your business goals and the state of your content, Laura says. TIP: When auditing for content quality, don’t be tempted to capture a binary rating like “keep or delete.” That’s “stark” and unhelpful. Laura encourages you to give more nuance to this question. Create a quality scale, and put words on it (not five stars, because “those shades in the middle are harder unless you put some words on them,” she says). Consider a scale like “exemplary, good, meh, not good, crap.” A word-based scale especially helps (a) when more than one person is doing the evaluation or (b) when one person is doing a lot of evaluation. Provide content examples for each measure on your scale to make it easier to align people’s evaluations. Don’t be overeager to mark content for deletion. Sometimes deleting content screws up SEO value. Delete only content you’re sure isn’t useful to your audience. Ask yourself: If I were auditing my organization’s content, what facets would I capture for each item? To get an automated start on your inventory of web-based content, you can use a web-scraping tool, such as SiteOrbiter, Screaming Frog, CAT (Content Analysis Tool), or Trim. When a site is small enough to justify manual capturing, Laura’s favorite method is to copy the URL and paste it into a spreadsheet. “There’s no better way to see what you have than to do it by hand,” she says. Ask yourself: If I were auditing my organization’s content, what form would I want the inventory to take? And what capturing tool or method makes the most sense for our content and main goal? Laura chooses the example of the Starbucks home page because everyone knows the brand and because she’s a fan of the company. She points out that in a real inventory and audit, she would ideally look at all of the website’s pages, all the videos, all the social media channels where people talk about the brand, all the point-of-sale materials, and so on. To illustrate her audit approach, Laura walks through this template. While she uses a simplified table here, chances are you’ll have more than a dozen columns. There’s no right number or set of columns; simply capture data and observations according to your audit’s goal. For the Starbucks home page, in the “ID” column, you would capture the URL. Then you would move on through the columns. For example, if your goal is to evaluate how well the content supports the company’s messaging, you might have a “Messaging” column (as shown here), where you would note the messaging you get from that page and how well it lines up with the intended messaging. After filling in a row, you would move to the next piece of content in a new row. Ask yourself: If I were auditing my organization’s content, what kind of data and observations would my team and others find most helpful for making strategic decisions about all that content? A content audit is no trivial effort. It can seem daunting. At the same time, you can’t make strategically sound decisions about your content without a solid sense of the content you already have. When was the last time your organization audited its content across all departments and all channels for all digital and nondigital content types? 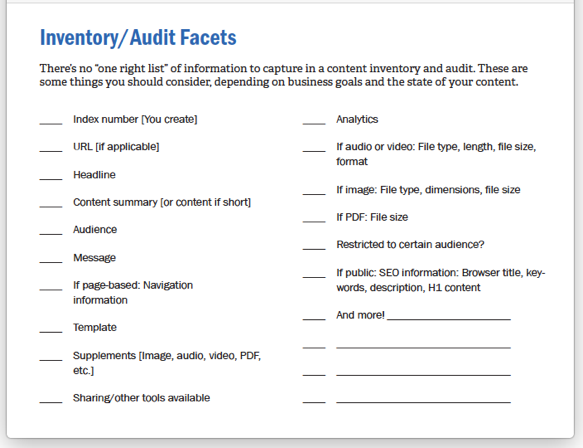 What have you learned from doing (or not doing) content inventories and audits? What would you do differently next time? Want to make your content work better for your company? Learn how at the Intelligent Content Conference March 20-22 in Las Vegas. Register today.